The Numismatic Ambassador Award was started in 1974 by Cliff Mishler of Krause Publications. The award is given to unsung heroes at the grassroots level of coin collecting, as well as nationally known numismatists. The award is a service award for those numismatists who have given countless hours of service to their local, regional, or national organization. The award was sponsored by Numismatic News through 2014. The Florida United Numismatist (FUN) has sponsored the program since 2015. 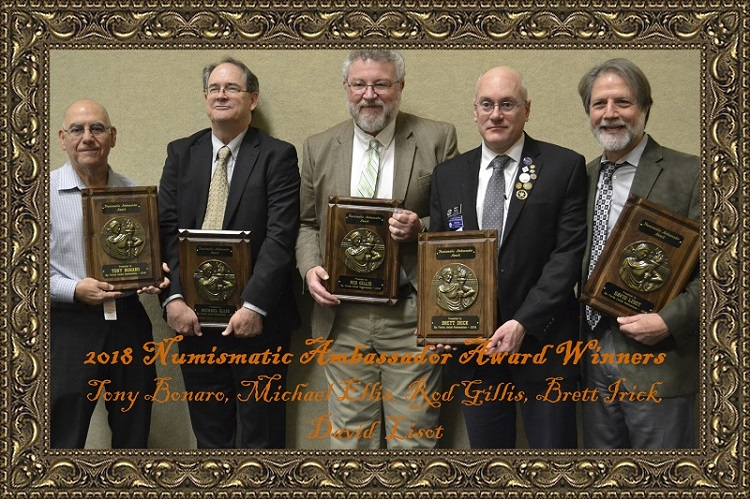 Every January a new group of ambassadors are announced during the annual FUN convention at the Numismatic Ambassador Awards breakfast, The award is presented by Dave Harper, editor of Numismatic News. An ambassador can be nominated by anyone. Once we have all of the nominees, the names and biographies are sent to the current ambassadors for a vote. The Ambassadors vote for 1 to 5 of the nominees, the top 5 vote getters are awarded the Numismatic Ambassador Award in January. They each receive a plaque and a lapel pin. There are currently 200+ Ambassadors alive of the 400 or so Numismatic Ambassadors. In 1974, 13 Ambassadors were chosen. Then over the next 25 years, an average of 10 were chosen every year. Today we choose 5 per year. You can nominate a future Numismatic Ambassador by printing the form from the link below.